From Calitzdorp take the R62 to Ladismith, after 5km take the Matjiesvlei turnoff to the right. 4km further turn left and travel last 2km to farm. From Cape Town take the R62 to Ladismith. 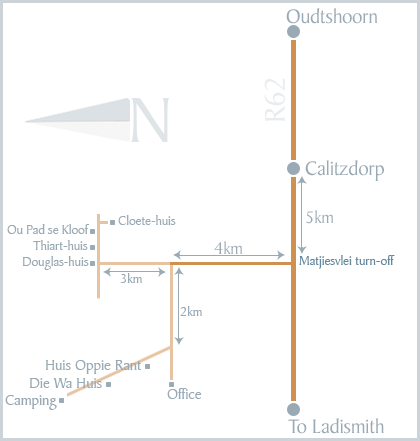 Continue on the R62 for 40km in the direction of Calitzdorp and turn left to Matjiesvlei. Travel 4km and turn left, continue for the last 2km to the farm.